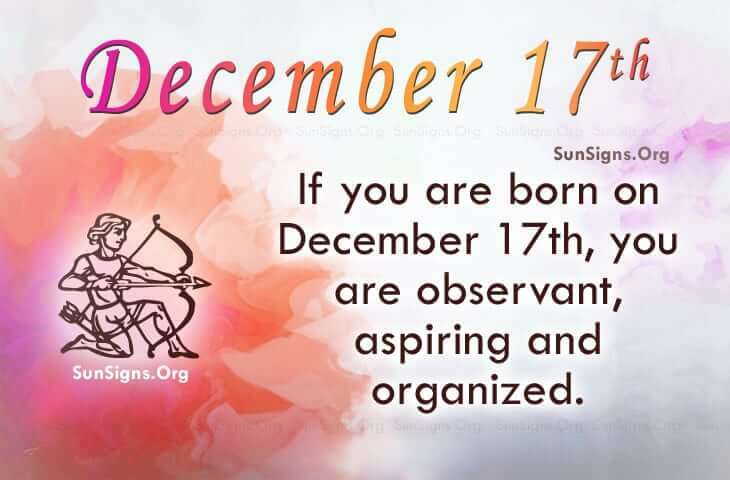 Famous people born on DECEMBER 17 are very capable Sagittarius. They can run their own life as well as run a successful business. They take note of the fine print and can read between the lines. In addition, they have what is called “gut instinct”. With that said, this is a extraordinary combination to have as a resource when a great deal of money is on the line. In the event of an upset, they are ready with a back-up plan. Having a plan seems to be what they do as they are called on to be the party planner especially for charity. Famous celebrities born on December 17 have a knack for putting the right people together to make a gala evening larger than life. When it comes to a career, this could be it. If in doubt, marketing and communication makes for a wise second round pick. Money is not the only motivator but the rewards that come with the career are a must. Famous people born on DECEMBER 17th are the one who plan the family reunions or church events. This could be their gift as an organizer. Their parties are always a hit as they know who to put together also for the best of times. Yes… they are observant and aspiring. They’re the talk of the town.